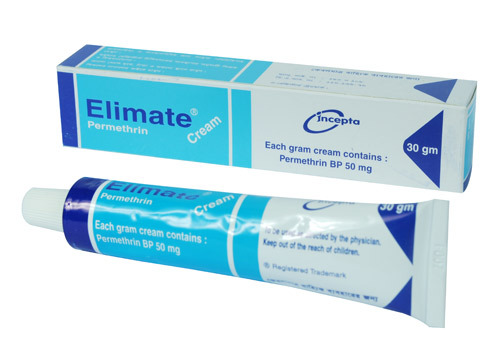 Elimate Cream: Each gram of cream contains Permethrin BP 50 mg.
Permethrin is a synthetic pyrethroid that possesses a broad spectrum of pesticidal activity and low mammal toxicity. It acts on the nerve cell membrane of parasites to disrupt the sodium channel current by which the polarization of the membrane is regulated. Delayed repolarization and paralysis of the pests are the consequences of this disturbance. Permethrin is rapidly metabolized by ester-hydrolysis to inactive metabolites, which are excreted primarily in the urine. Permethrin cream is indicated for the treatment of scabies (infestation with Sarcoptes scabiei). Adults and children over 12 years : A full tube. Children aged 6-12 years : Up to 1/2 of a tube. Children aged 1-5 years : Up to 1/4 of a tube. Children aged 2 months to 1 year: Up to 1/8 of a tube. -Patients aged over 2 months can use Permethrin cream. - Cream should be applied to clean, cool and dry skin. If body is warm due to hot bath or any other reason, skin should be allowed to cool. - For adults and children over 2 years, apply the cream to the whole body from the neck down, rubbing lightly on the skin until the cream disappears. - For babies, aged 2 months to 2 years, geriatric and immunocompromised patients, the cream should be applied to the face, neck, ears, and scalp as well, only avoiding the area immediately around the eyes and mouth. - The cream should be left on for 8-12 hours before washing off. The cream must be reapplied to any area that may be washed during the treatment time (such as after washing of hand). - Usually, 30 gm of cream is sufficient to treat an average adult; but if necessary, maximum two tubes (60 gm) can be used as a single dose. One application is generally curative; but may be repeated after 7 days, if necessary. In scabies patients, generally mild and transient burning and stinging are followed by application of Permethrin. Other temporary symptoms of irritation including pruritis, erythema, numbness, eczema and rash may occur. In patients treated for scabies, itching may persist for up to 4 weeks post-treatment. This is generally regarded as due to an allergic reaction to the dead mites under the skin and is not necessarily indicative of treatment failure. Scabies infestation is often accompanied by pruritis, edema and erythema. Treatment with Permethrin may temporarily exacerbate these conditions. Patients should be advised to avoid contact with eyes during application. If this occurs, immediately flush eyes with water. Lactation : It is not known whether Permethrin is excreted in human milk. Because many drugs are excreted in human milk, consideration should be given to discontinuing nursing temporarily or withholding the drug while the mother is nursing.